As you tour over Southern Labrador in a helicopter, the aerial view of the White Bear River Falls and wilderness surrounding them is breathtaking. the entire area in one crossing and the true size of the falls. The white water rushes over the massive boulders and slowly calms down as it continues on down the river where you will find fisherman testing their luck during the salmon runs. Aerial view of White Bear River Falls in Southern Labrador, Labrador, Newfoundland Labrador, Canada. 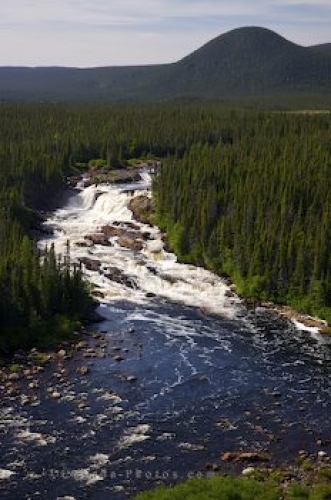 Aerial of the White Bear River Falls in Southern Labrador surrounded by wilderness.